Earth sheltered home designs are many and varied but beneath all the fancy design work (and grass) the principle is a, relatively, simple one. 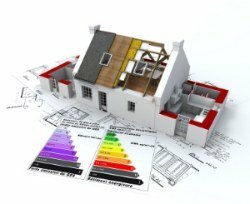 You pile soil up around the walls and often over the roof to provide thermal mass and insulation. This in turn regulates the temperature in your home. OK, that’s a very simple explanation, so I guess I should go into a little more detail. During a hard frost the surface of the ground freezes. But a short distance below the surface (20cm – 1m, depending on the length of the cold spell) the ground is warm enough to stop it freezing. This is because the thermal mass of the soil is so great it heats up and cools down very slowly. So it would take a very long time for the soil at this depth to actually freeze. Do you live in an earth sheltered house or perhaps you are planning to build one. Either way click here to tell all our readers why you think earth sheltered houses are the best! Anything buried below this frost level won't freeze. Equally in the summer it won't heat up very much for the same reason. The temperature variation in the south of England is between 6 and 11 °C between 1m and 3m below ground. 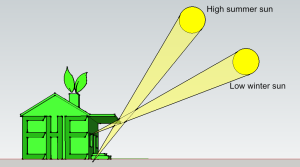 Earth sheltered homes just use this principle to avoid over heating in the summer and to retain heat in the winter. 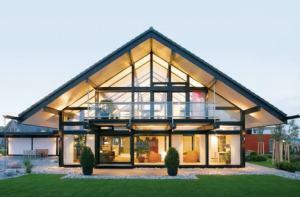 There are three main types of earth sheltered home designs which are detailed below. Earth Berms - where piles of earth are simply piled up against the walls of the house and even over the roof if required. Building into the side of a hill - (in the UK the exposed side should be south facing to take advantage of the sun’s heat). Dig a hole - build your house underground and then fill in the gaps with soil. Sound proofing - they are very well sound proofed due to the huge mass of soil against the walls. 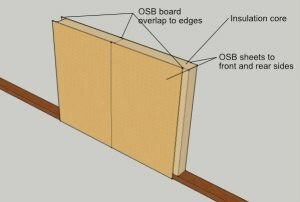 Draught proofing - they are easy to draught proof for the same reason as above. Good Energy Savings - due to the fact that they stay warm in the winter you'll need less heating and therefore reduce you energy bills. They can even keep your home cool in the summer. They're ideal for use as passive homes - you can have all your glazing to the south elevation and no glazing to the north and you can cover the roof to get even better results. The soil helps draught proof the house and the thermal mass helps maintain a base temperature which is then easy to boost with sustainable sources such as heat pumps or solar thermal panels. Water penetration - the walls (and roof) that are covered with soil need to be very well sealed to avoid leaks. Lack of natural light - this should only be a problem if the house is poorly designed. 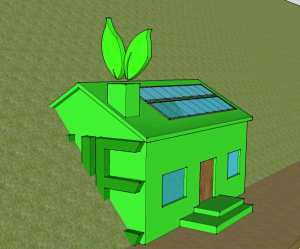 Use an architect who has experience in preparing earth sheltered home plans and use LED lights where possible to keep running costs low. Condensation - just like a passive house, an earth sheltered home can suffer from condensation and stale air due to the fact it's so well draught proofed. The solution is to install a good air handling/heat exchange system to replace the warm stale air with fresh air from outside and heat it in the process. Difficult to find experienced builders - as this isn't a widely used form of construction in the UK it can be difficult to find an experienced builder. When you do manage to find one it can be expensive, so do all your sums before you commit yourself. Non environmentally friendly materials - they tend to be made from reinforced concrete which isn't particularly environmentally friendly. It is however the best product to stand up to the lateral forces from the weight of soil and concrete is easier to waterproof. Plant Roots - you need to consider what trees etc. are in the immediate vicinity of the house as trees take up moisture from the ground and their roots can cause damage to foundations etc. If you remove the trees there is nothing to take up the water and you can end up with soil heave where the soil swells up and lifts the house. Soil Tests - as you've probably figured out, it's very important to get a soil analysis carried out to make sure the soil conditions are suitable. It needs to have good load bearing capabilities, drain well and resist erosion. It also needs to be stable during frost and not subject to dramatic thermal expansion or contraction. 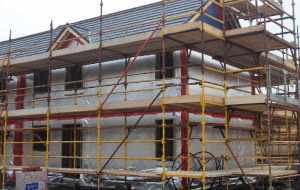 Unlike traditional houses where the insulation is placed in the cavity of the house, with earth sheltered home designs the insulation is placed on the outside of the exterior walls between a sandwich of waterproofing layers. 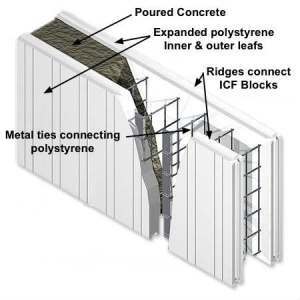 So once the concrete walls are up, a layer of waterproof adhesive is applied before a heavy polyethene sheet (typically ethylene propylene diene monomer EPDM) is stuck to the outside face of the wall to prevent moisture ingress and act as a vapour barrier. Then insulation (normally sheets of close cell rigid foam) is stuck to the outside of the water barrier which has the added benefit of protecting the water proofing layer from tree roots and frost etc. Do you have an earth sheltered home that you're proud of ? It you are the proud owner of an earth shelterd home or are about to build one? Share your story here! Tell every one why they are so great and why you love it!